I wasn't sure if I had watched Princess Mononoke, because I have watched a number of animated features from Japan whose titles don't always stick in my head, except for Howl's Moving Castle, which is the one with the moving castle. This one is of course the one with Princess Mononoke, but this is confusing because she isn't really a princess (although she is more or less a real mononoke, which is apparently halfway between "spirit" and "monster.") I had not seen it. It is a longish epic adventure, with vaguely pious gestures towards environmentalism and quite a lot of what I take to be Japanese mysticism, but this is not always easy to parse from the outside. Its biggest strength as an epic adventure is that it avoids a simple good-guys and bad-guys structure. The iron-making human village is despoiling nature and so you'd expect it to be bad, but it is also a fairly happy, prosperous, socially progressive community. The boars, who are part of nature and so presumably good, are a bunch of vengeful numbskulls. The apes are... well, I never figured out what they were up to. Plot: A demon attacks an isolated village. The extremely handsome and serious-minded young prince saved the day, but gets infected with demonitis. The village matriarch tells him that he must therefore go on a quest. 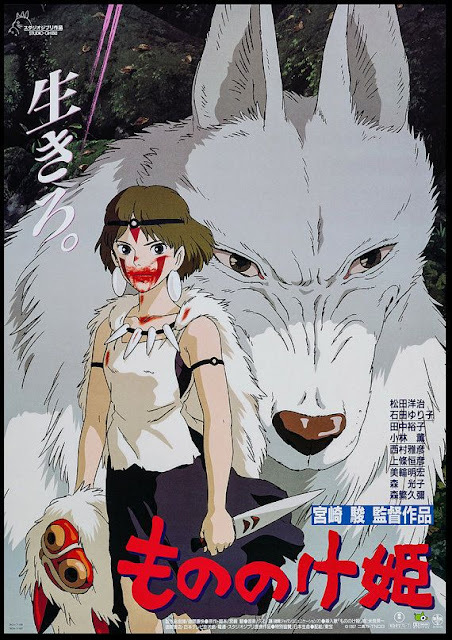 In his adventures, he meets Princess Mononoke, a young human who has been raised by a wolf goddess and will need lots of therapy to sort out her identity issues when she reaches adulthood. He first catches sight of her in the woods, face smeared with blood from tending to the wounds of her wolf-goddess mother, and falls in love on the spot, as what young man wouldn't? His love for her will motivate most of his actions for the rest of the film right up to the conclusion, when they will perfunctorily decide to be just friends, since he's a human and she's a wolf. Meanwhile, a lot of action will take place: forces of the Emperor attack the iron-making human village, since iron weapons are powerful and destabilizing! The village teams up with the Emperor's henchmen to attack the Spirit of the Forest, for no particular reason! The prince defends the Spirit of the Forest, perhaps in order to impress Princess Mononoke! The various animal communities talk the talk about defending the Spirit of the Forest, but mostly just bicker and fall into in-fighting! There's another demon running around! You lose track of what's going on, but fortunately the cinematography always gives you clues on who you want to win any given battle. Visuals: Princess Mononoke was an important film in establishing the style of Japanese animation that many, many people think is revolutionary and enchanting. I am clearly missing something here, for to me it just looks like pretty-darn-good animation. We saw it on the big screen, where it looked especially pretty-good. Dialog: We saw the version that was dubbed in English by a talented, all-star cast. I dislike dubbing in live-action movies, but it works fine in animated films, which after all are dubbed in their original language, too. Prognosis: With many moments of beauty, violence, cuteness, humor, and suspense, it offers the complete package in terms of entertainment. It avoids blacks and whites of morality, which is good, but lets you lose track of why people (and deity animals) are doing what they're doing, which is kinda bad. It feels just a little bit like church, but fortunately it doesn't really have a coherent message to deliver.